Context: Alcohol is known to degrade and dissolve the bisphenol A glycidyl methacrylate present in the composite resin. The effect of alcohol containing mouthrinses on the shear bond strength of orthodontic metal brackets bonded with composite resin has not been verified until date and is the purpose of this study. Aims: The aims and objectives of the present study were to evaluate (1) Whether there is a significant difference in the shear bond strength of metal orthodontic brackets after the 1 year (12 h) and 2 years simulation (24 h) of mouth rinsing with 4 different commercially available mouthrinses (2 alcoholic and 2 alcohol-free mouthrinses) when compared to the control. (2) Whether alcohol containing mouthrinses have more adverse effect on the shear bond strength when compared with alcohol-free mouthrinses. 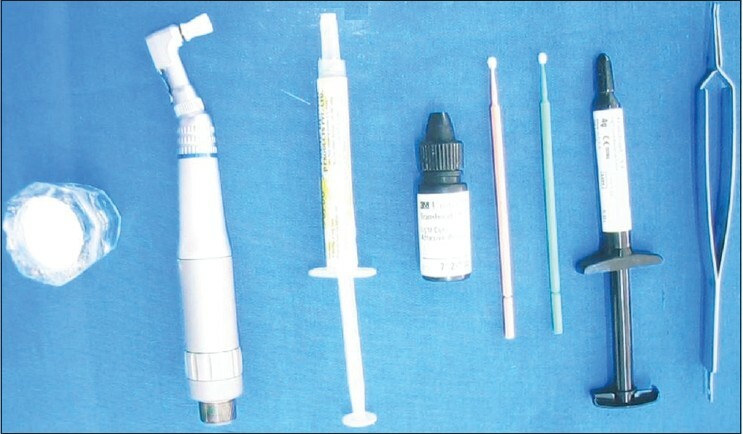 (3) To assess the site of bond failure using adhesive remnant index. Setting and Design: Experimental - laboratory based. Materials and Methods: A total of 100 upper premolars extracted for orthodontic purpose were collected immediately after extraction, cleared soft-tissue debris and blood and immediately stored in distilled water with 0.1% thymol crystals added to inhibit bacterial growth. Two alcohol containing mouthrinses and two alcohol-free mouthrinses were used and the bonded teeth were placed in the mouthrinses for a stipulated period of time (1 year simulation and 2 years simulation) and shear bond strength were tested using Lloyd Universal Testing Machine. Statistical Analysis Used: The data were analyzed using analysis of variance and paired samples t-test. Results: After the 1 year and 2 years simulation time, samples stored in alcohol containing mouthrinses showed lower bond strength (P < 0.05) when compared to samples stored in alcohol free mouthrinses and distilled water (control). Conclusion: Alcohol containing mouthrinses affect the shear bond strength of the metal orthodontic brackets bonded with composite resin (Transbond XT in the present study), more when compared with alcohol-free mouthrinses. It is, therefore, highly advisable to avoid alcohol containing mouthrinses in patients undergoing orthodontic treatment and use alcohol-free mouthrinses as adjuncts to regular oral hygiene procedures for maintaining good enamel integrity and periodontal health, without compromising the shear bond strength of the bonded metal brackets. Mouthrinses are regularly being prescribed for orthodontic patients as an oral hygiene aid to prevent enamel decalcification, gingivitis and periodontal breakdown. Most mouthrinses contain 18-26% alcohol as a solvent, preservative and semi-active ingredient. Several studies ,,,,,,,,,, have proved that alcohol-containing mouthrinses degrade composite resin restorations and accelerate the resin wear by dissolving the bisphenol A glycidyl methacrylate (BIS-GMA) present in composite resin. However, the effect of these mouthrinses, used during orthodontic treatment, on the shear bond strength of orthodontic metal brackets has not been studied until now. 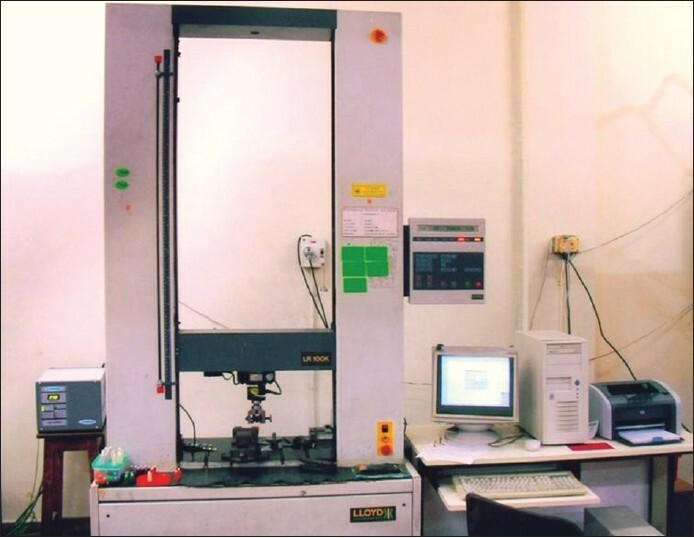 Universal testing machine: (Lloyd). Capacity 100 kN [Figure 4]. All bonding procedures were carried out by the same operator and a standard protocol was followed. The teeth were etched with 37% orthophosphoric acid gel for 30 s, rinsed with water for 10 s and dried for 10 s. After applying primer to the tooth surface, composite was applied to the bracket base and bonded on the teeth. The excess composite was removed and then light cured for 40 s. All brackets were bonded with bracket base perpendicular to the buccal surface and parallel to the direction of shear debonding force. After bonding, the specimens were stored in distilled water at 37°C for 24 h in an incubator to allow full curing of the composite, before being put into one of the mouthrinses. Various studies ,, have used this simulation time for evaluating the effect of alcoholic and alcohol-free mouthrinses on the composite resin. The simulation time for 1 year and 2-year mouthrinse use has been calculated as follows. To simulate a 1-year regimen of rinsing for 2 min/day, (2 min/day × 365 days = 730 min. Simulated by 12 h × 60 min = 720 min). The 1-year simulation experimental groups were stored in 20 ml of one of the mouthrinses for a period of 12 h (which has been reported to be equivalent in time to 1 year of 2 min of mouth rinse use-once a day) as done by Gürgan et al. , Gürdal et al. and Yap et al. [Figure 5]. The 2-year simulation experimental groups were stored in 20 ml of one of the mouthrinses for a period of 24 h (which has been reported to be equivalent in time to 2 year of 2 min of mouthrinse use-once a day) as done by Yap et al. 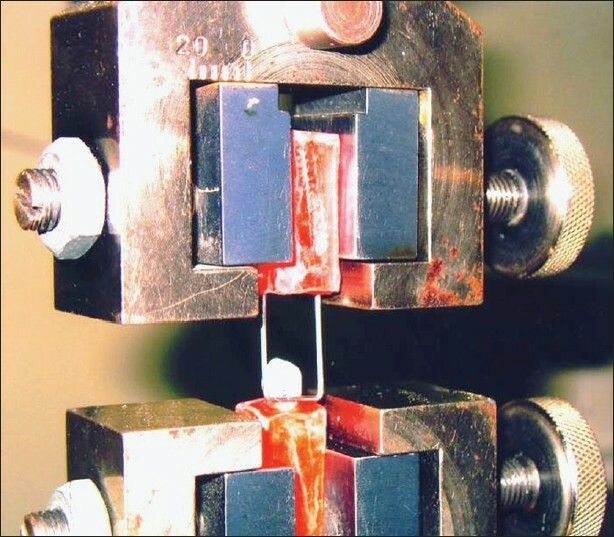 Specimens in mouthrinses were shaken every hour, to prevent chemical equilibrium around the composite bracket interface and kept at 37°C throughout the study. At the end of the specified time, the specimens were removed and submerged in distilled water. 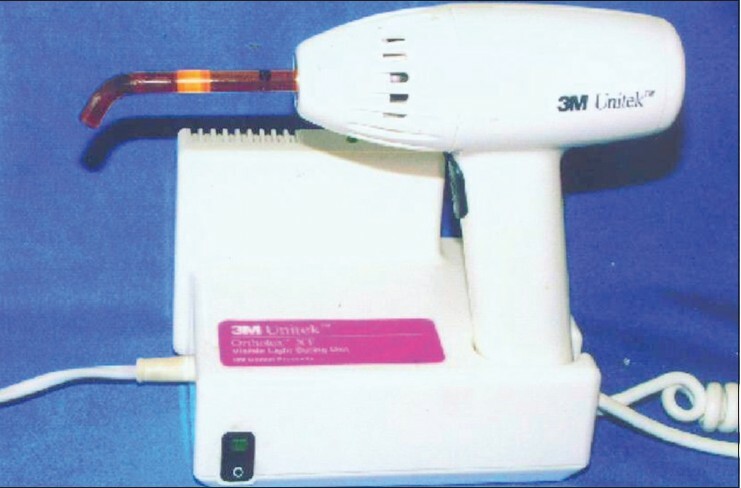 The teeth were mounted in cold curing acrylic resin [Figure 6] and bond strength evaluated using a Lloyd universal testing machine [Figure 7]. Descriptive statistics including the mean, standard deviation and minimum and maximum values were calculated for each of the nine test groups. Analysis of variance was used to determine if significant differences were present in the shear bond strength between the nine groups. If statistical differences were present, BONFERRONI multiple range tests were used to determine which of the means were significantly different from each other. Significance for all statistical tests was predetermined at P < 0.05. The surface of the debonded specimens was studied under a stereomicroscope under ×10 magnification to identify the site of bond failures between enamel, adhesive and bracket base. ,, The samples were mounted in acrylic and color coded by an operator who was blind to the purpose of this study. 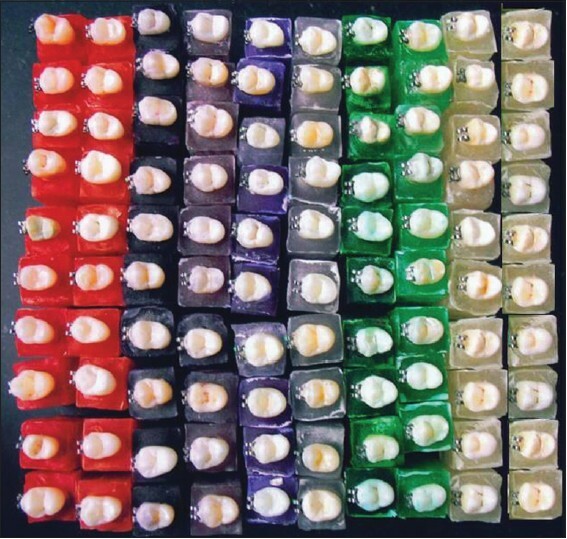 Shear bond strength testing and adhesive remnant index (ARI) scores determination were performed by the examiners, who were blinded to the color coding of the samples (to which group the teeth belonged), in order to eliminate observer bias. If there were any variation in the ARI scores between the observers, a third examiner determined the score. 3: Entire adhesive left on the tooth, with a distinct impression of the bracket mesh. The mean and standard deviation of various groups studied are as given below [Table 1]. Group C 4 S Flo 24 h = 8.665 + 0.69 MPa. Group B 2 had significantly lower bond strength than Group C 4. The comparison of shear bond strength has been shown in the form of a bar chart [Figure 8]. Paired t-test [Table 2] between the same groups indicated that there was no significant difference between the 12-h bond strength and the 24-h bond strength for the same mouthrinse groups. Group A: For 70% samples, the entire adhesive was left on the enamel and for 30% half or more than half of adhesive was left on enamel. Group B 1: For 50% more than half of adhesive was left on enamel and for 40% all adhesive was left on the enamel and 10% less than half of adhesive was left on enamel. Group B 2: For 50% more than half of adhesive was left on enamel and for 30% all adhesive was left on the enamel and 20% less than half of adhesive was left on enamel. Group B 3: For 60% all adhesive was left on enamel and for 40% more than half of adhesive was left on the enamel. Group B 4: For 60% all adhesive was left on enamel and for 40% more than half of adhesive was left on the enamel. Group C 1: For 60% all adhesive was left on enamel and for 40% more than half of adhesive was left on the enamel. Group C 2: For 50% all adhesive was left on enamel and for 50% more than half of adhesive was left on the enamel. Group C 3: For 70% all adhesive was left on enamel and for 30% more than half of adhesive was left on the enamel. Group C 4: For 60% all adhesive was left on enamel and for 40% more than half of adhesive was left on the enamel. Ethanol has been known to have a softening effect on the BIS-GMA matrix copolymer and lower the wear resistance of composite resins. This is due to the diffusion of ethanol into the composite, which results in micro cracking. Ethanol has solubility characteristics similar to BIS-GMA and this may promote the infusion of ethanol into the composite leading to further damage. In the present study Listerine, containing 21.6% ethanol, reduced the shear bond strength significantly compared with the control. This may be attributed to the high ethanol content present in Listerine. This is supported by various studies performed by Cavalcanti et al.,  Roberts et al.,  and Yap et al. that proved Listerine softens the composite resin and reduces composite hardness. Colgate Plax reduced the shear bond strength for both 12 h (1-year simulation) and 24 h (2-year simulation), but statistical significance was present only for the 2-year simulation. This reduction in shear bond strength could be due to the ethanol present in the mouthrinse. The reason it does not affect shear bond strength as drastically as Listerine may be due to the fact that the alcohol content in Colgate Plax is less (12% ethanol) when compared to Listerine (21.6%). This reduction in the shear bond strength is supported by the study done by Cavalcanti et al.,  which showed that Colgate Plax softens composite resin and reduces composite hardness. Hexidine, containing 0.2% chlorhexidine, showed reduced bond strength for both 12 h (1-year simulation) and 24 h (2-year simulation), when compared to the control, but statistical significance was present only for the 24 h (2-year simulation) period. However, this bond strength was higher when compared to alcohol containing mouthrinses (Listerine and Colgate Plax) for the same period. S Flo, containing 0.2% sodium fluoride, showed a very negligible reduction in the bond strength for both 1 year simulation and 2 year simulation when compared to the control, but it was not statistically significant. However, this bond strength was higher when compared to alcohol containing mouthrinses. According to Reynolds,  maximum bond strength of 5.9-7.9 Mpa is adequate in the oral cavity. For Transbond XT, various studies report a shear bond strength ranging between 9.2 Mpa and 10.5 Mpa. ARI values indicated that bond failures for all the groups occurred in a similar manner. However, it was found that Group B1 (Listerine 12 h) and Group B4 (Listerine 24 h) showed more cohesive failures within the composite while the other groups showed more failures at the bracket adhesive interface although it was not statistically significant. This could be due to the fact that the ethanol in Listerine was capable of dissolving the BIS-GMA in the composite, thereby inducing cohesive failure within the composite. The results of this study indicated that Listerine (21.6% ethanol) significantly lowers the bond strength over a 12 h (1 year simulation) and 24 h (2 year simulation) period when compared to the control. Colgate Plax (12% ethanol) does not affect the bond strength over a 12 h (1 year simulation) period, but significantly reduces the bond strength over a 24 h (2 year simulation) period when compared to the control. Hexidine does not affect the bond strength over a 12 h (1 year simulation) period, but significantly reduces the bond strength over a 24 h (2 year simulation) period when compared to the control. 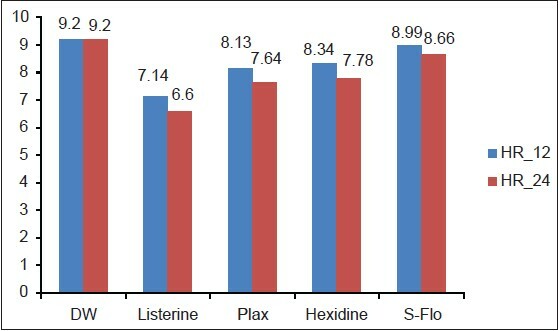 However, the 24 h bond strength for Hexidine was higher than the alcoholic mouth rinse groups (Listerine and Colgate Plax) for the same 24 h period. Listerine significantly lowers the bond strength over a 12 h (1 year simulation) period when compared to S Flo for the same 12 h (1-year simulation) period. Listerine significantly lowers the bond strength over a 24 h (2 year simulation) period when compared to S Flo for the same 24 h (2 year simulation) period. The results of the present study, conclusively proves that alcohol containing mouthrinses affect the shear bond strength of metal orthodontic brackets bonded with composite resin (Transbond XT in the present study), more when compared to alcohol-free mouthrinses. The limitations of this study are this being an in vitro study; it does not truly reflect the oral environment. Since the in vitro testing can never simulate oral conditions precisely, direct extrapolation of the findings to the in vitro conditions may not be possible. Clinically, the effects of mouthrinses on shear bond strength may be modified by many factors that could not be replicated in this study. Saliva may dilute or buffer the mouth rinse and salivary pellicle might have a protective effect. Thus, the variables are numerous and the results need to be interpreted with care. Extensive clinical trials over extended periods are needed to evaluate the in vitro effects of alcoholic and alcohol-free mouthrinses on the bond strength and bracket failure rates in orthodontic patients. ARI scores revealed there was no significant difference in the site of the bond failure between the different groups. It has been found in this study that alcohol-containing mouthrinses affect the shear bond strength, of metal brackets bonded with composite resin adhesives, more when compared to alcohol-free mouthrinses. It is therefore highly advisable to avoid alcohol containing mouthrinses in patients undergoing orthodontic treatment and use alcohol-free mouthrinses as adjuncts to regular oral hygiene procedures for maintaining good enamel integrity and periodontal health without compromising the shear bond strength of the bonded metal brackets. 1. Asmussen E. Softening of BISGMA-based polymers by ethanol and by organic acids of plaque. Scand J Dent Res 1984;92:257-61. 2. Cavalcanti AN, Mitsui FH, Ambrosano GM, Mathias P, Marchi GM. Effect of different mouthrinses on Knoop hardness of a restorative composite. Am J Dent 2005;18:338-40. 3. Ferracane JL, Berge HX. Fracture toughness of experimental dental composites aged in ethanol. J Dent Res 1995;74:1418-23. 4. Gürgan S, Onen A, Köprülü H. In vitro effects of alcohol-containing and alcohol-free mouthrinses on microhardness of some restorative materials. J Oral Rehabil 1997;24:244-6. 5. Hobson RS, McCabe JF, Hogg SD. The effect of food simulants on enamel-composite bond strength. J Orthod 2000;27:55-9. 6. Lee SY, Greener EH, Mueller HJ, Chiu CH. 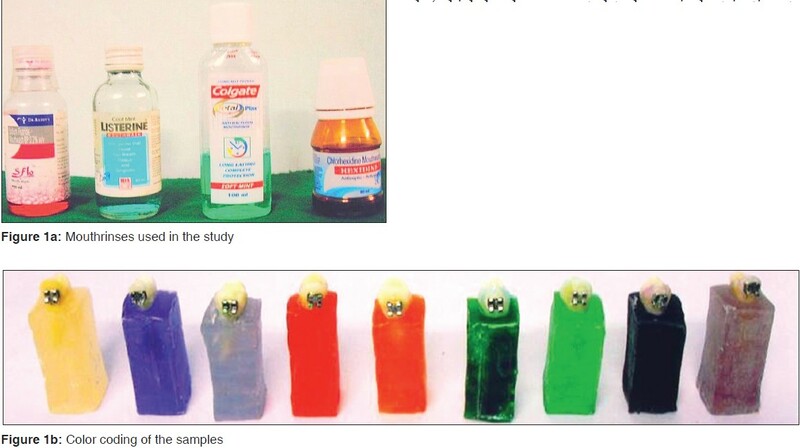 Effect of food and oral simulating fluids on dentine bond and composite strength. J Dent 1994;22:352-9. 7. Roberts HW, Karpay RI, Mills SE. Dental unit waterline antimicrobial agents' effect on dentin bond strength. J Am Dent Assoc 2000;131:179-83. 8. Wu W, McKinney JE. Influence of chemicals on wear of dental composites. J Dent Res 1982;61:1180-3. 9. McKinney JE, Wu W. Chemical softening and wear of dental composites. J Dent Res 1985;64:1326-31. 10. Gürdal P, Akdeniz BG, Hakan Sen B. The effects of mouthrinses on microhardness and colour stability of aesthetic restorative materials. J Oral Rehabil 2002;29:895-901. 11. Yap AU, Tan BW, Tay LC, Chang KM, Loy TK, Mok BY. Effect of mouthrinses on microhardness and wear of composite and compomer restoratives. Oper Dent 2003;28:740-6. 12. Reynolds IA. A review of direct orthodontic bonding. Br J Orthod 1975;2:171-8. 13. Iijima M, Ito S, Yuasa T, Muguruma T, Saito T, Mizoguchi I. Bond strength comparison and scanning electron microscopic evaluation of three orthodontic bonding systems. Dent Mater J 2008;27:392-9. 14. Nemeth BR, Wiltshire WA, Lavelle CL. Shear/peel bond strength of orthodontic attachments to moist and dry enamel. Am J Orthod Dentofacial Orthop 2006;129:396-401. 15. Minick GT, Oesterle LJ, Newman SM, Shellhart WC. Bracket bond strengths of new adhesive systems. Am J Orthod Dentofacial Orthop 2009;135:771-6.